← Just bought myself new wheels! I recently learned about the TT suspension arms. Did you know Audi made changes to the suspension arms on the TT in 2001? The original arms (we could say the MK1 arms) were much more communicative in terms of steering feedback and were allowing faster “turn in”. So why the change, I asked myself. Here’s the reason. The changes were part of the voluntary recall of early TTs (see below). You probably remember that early TT models gained press coverage for a series of high-speed accidents in Europe. Reported crashes and related fatalities occurred at speeds in excess of 180 kilometers per hour, during abrupt lane changes or sharp turns. So all TTs were recalled by Audi in late 1999/early 2000, to improve predictability of the car’s handling at very high-speeds. Audi’s ESP (Electronic Stability Program) and rear spoiler were added, along with suspension modifications. The suspension mods included a front lower control arm design change (we could say the MK2 arms) and modifications to the sway bar and shock rates. All changes were subsequently incorporated into future series production versions of the car until the end of the production in June 2006. The control arm change introduced understeer to the cars handling, as it makes the handling of the car more “muted” and safer for non-skilled drivers. I was disappointed when I first raced my TT on a track. It produced lots of understeer and the car handled like a front wheel drive car with no way of cornering. A solution to this has been attacked on several fronts. A common approach is to increase the rear and front anti-roll bar diameters. Another solution is to install polyurethane bushings in the front control arm bush position to dial out some understeer. And for big turbo guys like me, a Haldex controller change is vital. The “Holy Grail” solution for TT enthusiasts, though, has been to obtain a set of original MK1* control arms. This has proven very difficult – and quite costly – if they can even be found at all. Any original MK1* arms involved in the recall for the above modifications were destroyed. Many arms have been changed without specific knowledge of their performance attributes during routine work conducted as part of this optional recall. There is another option for this problem. No need to scour eBay, hoping to get lucky by finding one of the few remaining MK1* arms or scour scrap yards, in search of ’00 model year cars that had not undergone the recall work. 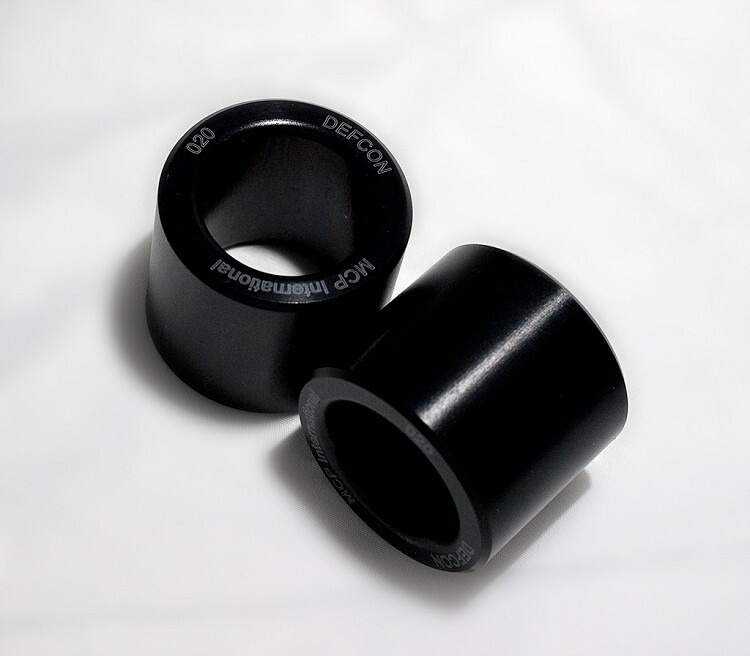 Introducing the “DEFCON” MK1* conversion bushings. Mike Phillips has engineered an adapter that is available through many websites. These DEFCON bushings convert your current MK2* arms, allowing them to accept OEM MK1* bushes (urethane MK1* front bushes are also compatible). The change induced in your car’s handling is significant: Faster turn in, significant reduction of understeer, and much more communicative steering feedback. In addition, rear bushes can be replaced with new, unworn MK2* bushes, or with original (softer) OEM MK1* bushes, so you can either duplicate the original MK1* arm characteristics EXACTLY, or tune to your specific needs. The DEFCON bushes are sold in 4 different packages. I will order one myself and let you guys know how I like it. Wak tried them and apparently loved them: “The change to handling is unreal! That additional few millimetres closed off by the collars turn the TT into a point and click machine, cornering is a joy, the handling has become extremely balanced, changes in direction are sharp and positive. I feel this is an excellent addition to the TT if you are after a simple and positive upgrade, get them they are great.” Read Wak’s review here. Also read more reviews on Mike’s web site. You can buy the DEFCON Bushes here. AUDI RECALL NO. KX/ZX.OWNER NOTIFICATION BEGAN MAY 8, 2000. OWNERS WHO TAKE THEIR VEHICLES TO AN AUTHORIZED DEALER ON AN AGREED UPON SERVICE DATE AND DO NOT RECEIVE THE FREE REMEDY WITHIN A REASONABLE TIME SHOULD CONTACT AUDI AT 1-800-822-2834. ALSO CONTACT THE NATIONAL HIGHWAY TRAFFIC SAFETY ADMINISTRATION’S AUTO SAFETY HOTLINE AT 1-888-DASH-2-DOT ‘1-888-327-4236’. This entry was posted in Audi TT MK1 Performance and tagged Defcon Bushes, Suspension. Bookmark the permalink. A useful insight into Audi TT Control Arms Solution: Defcon Bushes | Audi TT RS Project (Audi TT Tuning: Make an RS out of my 3.2 V6 MK1 -8N- Turbo) and ideas I will employ on my blog. You’ve obviously taken some time on this. Great! Really excellent post and as a TTOC newbie this has explained the DEFCON situation as have been trying to get a handle on front end modifications. So basically what you’re saying is that the MK2 Wishbones have a larger bush which creates understeer (For Safety). By fitting the Defcon to the MK2 Wishbones this reduces the diameter to dial out the understeer by emlating the MK1 arms. I just installed a Defcon 1 upgrade in my Mk I with 120K on the odometer. I liked the change so much I ordered new bushings for the rear. Might be a bit more work. It took me about 3 1/2 hours start to finish using a press to remove the old worn out parts and set the sleeve in front and OEM part in back.